My grandsons had a sleepover date with us last weekend. The oldest is nine, the middle grandson seven, and the littlest is three and a half. I enjoy planning special activities and crafts when we have time together, and decided the uninviting weather outdoors was the perfect opportunity to introduce them to the classic game of marbles. Marbles can be played indoors or out. When I was in elementary school we played the game on the playground in a circle drawn in dirt. For our indoor play, we created a circle with a piece of embroidery floss. 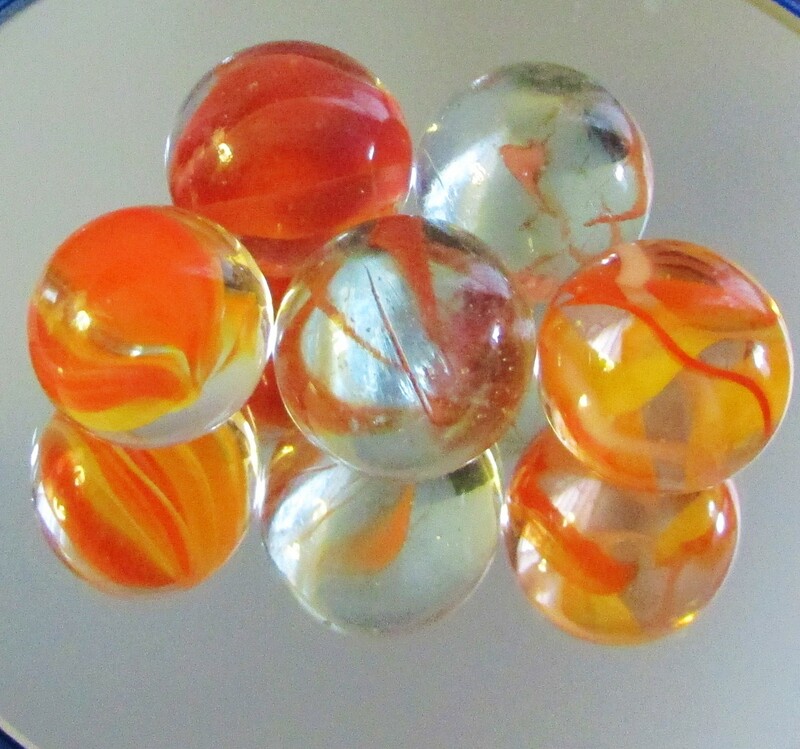 The classic rules of marbles are abundant in web searches, but we played by our own rules: one shot, no need to shoot with your thumb, a good hard roll with the shooter marble was all the skill that was needed. What is a shooter marble? It’s the largest of all the marbles, a bit like the cue ball in a game of pool. The shooter is used for knocking other marbles out of the circle. When you knock a marble out…it is yours to keep. We were shocked at how well the three year old played. He came close to winning most of the marbles, but came in second place to his dad. Marbles come in many colors and designs. 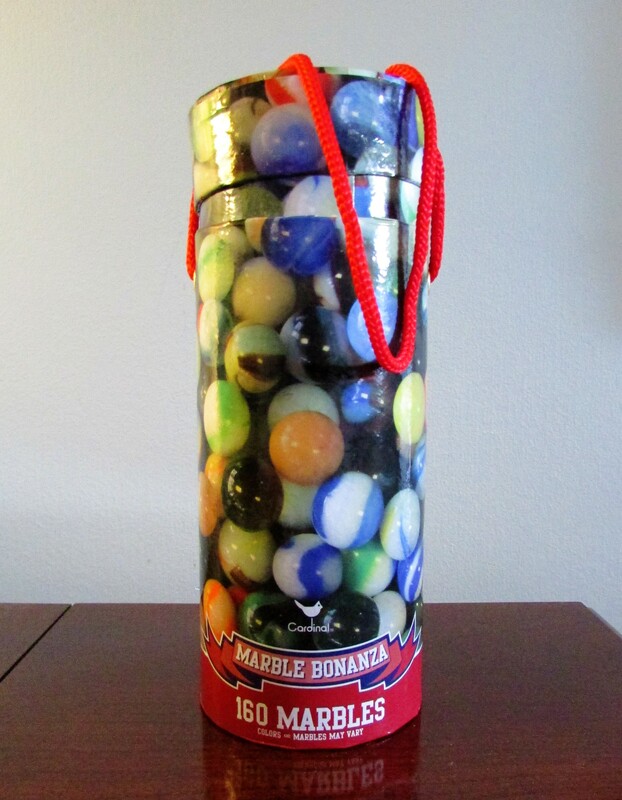 In a canister you might find cat’s-eye marbles, clear, with a swirl of color in them. Fancier opaque varieties that resemble planets in the solar system are also in the canister, but in lesser quantities. These mango-tango cat’s eye, a perfect choice for today’s Color Your World – 120 Days of Crayola challenge, were purchased in a local craft store. I bought our big canister for under three dollars with a 40% off coupon. Spinning tops was a favourite game of kids of my generation and of course marbles and the eternal ” playing house” games, which never go out of fashion. Oh Susie, you are so right. I forgot about “playing house.” It was a favorite of ours too. We would make our houses in trees, under trees, under sheets strung on the clothesline. In basements, in our rooms, anywhere we could find a space. We were blessed. I haven’t heard that phrase for years, thanks so much for reminding me. Remember having tea parties too??? So much fun…and our grandmother would tell us stories at night before we went to bed…made them up in her head…tales of naughty dolls getting into mischief, and oh how her eyes would twinkle as she made up the story. I remember the tea parties too ! Drinking lemonade in as small cups and saucers as we could find( not the readymade sets as found these days). We tried to make dolls houses from cartons. Our houses were sometimes made between two chairs with bed sheets strung across them. Wow, you did bring back golden memories. I’m glad the memories are golden ones today Susie. I enjoy technology but it has stolen a bit of the carefree imagination children. My older grandsons love technology, but they also love creating things like a playroom clubhouse. Their fun fills me with joy when they use laundry baskets and other recycled items to make their perfect place to play. So glad to hear all this from you. Gosh – this had me really reaching back in the memory bank. 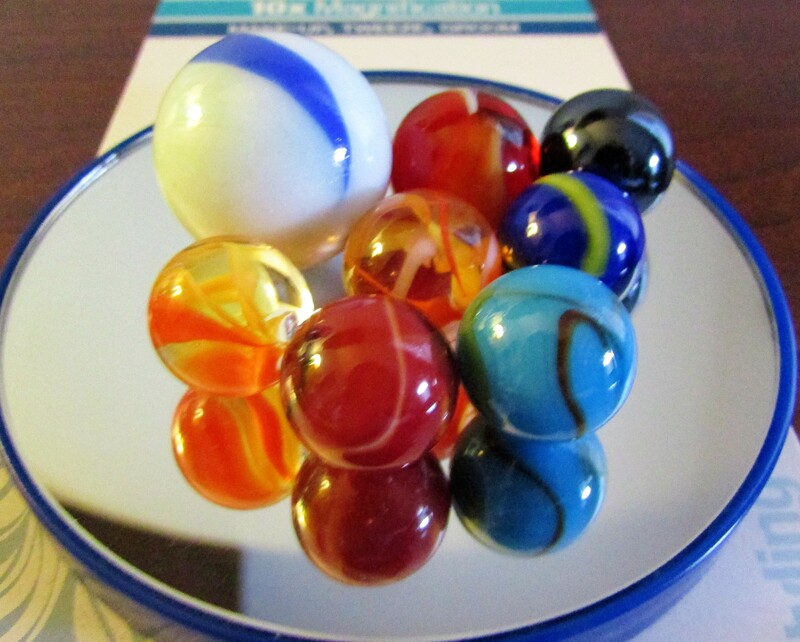 We played marbles as kids, and I can remember it being much fun with plenty of playful competition between siblings. Such a simple game, and yet endlessly entertaining, especially when you add in skill level activities like “combo knock outs” and “triple click” variations. Love it that you are introducing the “old days” to the new generation. Our generation had jacks, marbles, and playing chase with the fireflies. Enjoyed this post, and the photos really took me back to that earlier time in life when the sound of one marble hitting another was fun stuff! I forgot about jacks…I’ll have to look around for them. A friend and I spent hour after hour playing jacks one summer. Fireflies were a favorite too. I still get a thrill when they show themselves in summertime. I have a great memory of a few weeks spent with grandparents and cousins…collecting fireflies, and somehow, someone (though the culprit has never confessed) let the fireflies out, and we all woke up to the vision of our Pap-pap trying to capture them off of the ceiling in the middle of the night. What great days they were!